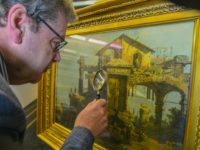 A painting donated to the University of Aberdeen 153 years ago has been authenticated as a work by the Venetian master Canaletto. 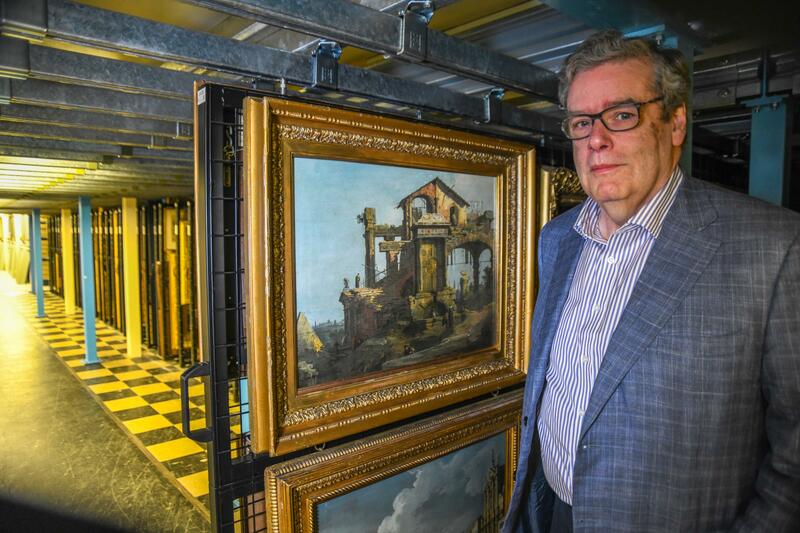 It was long believed to have been the work of his studio or school, but university art history professor John Gash and leading Canaletto expert Charles Beddington are convinced it was painted by the hand of Giovanni Antonio Canal (1697–1768) himself. Canaletto is famed for his views of Venice, but this work is more unusual in his oeuvre. It’s a capriccio, a fantasy composite of ancient ruins that don’t exist in real life, in this case a temple on which a modern cottage has been built. Peasant women hang out the wash they’ve done in the two fountains at the base and side of the ancient temple. 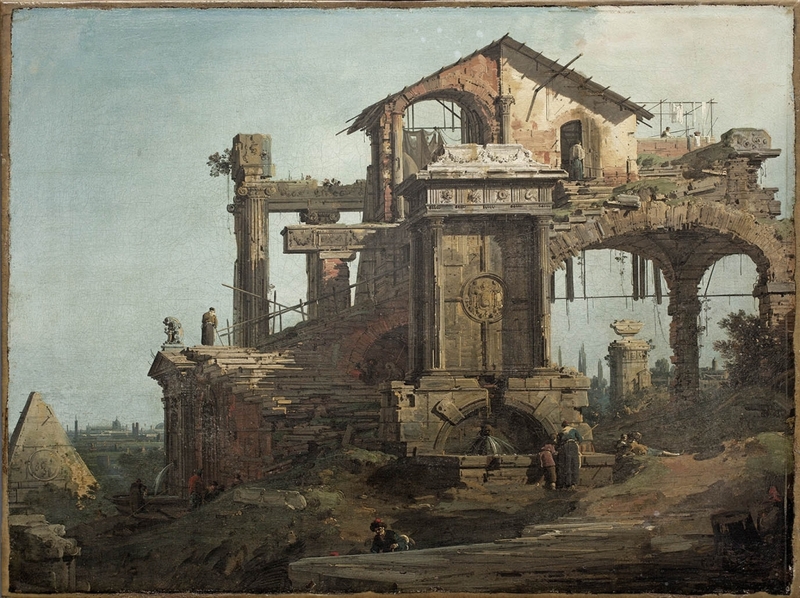 On the left is a pyramid highly reminiscent of Rome’s Pyramid of Cestius, the only pyramid in Italy, which makes an appearance in several of Canaletto’s works. There are three other capricci by Canaletto that share some features with the Aberdeen painting, and a collection of etchings by the artist also includes architectural and figural elements in common with this work. While it is not signed, many of Canaletto’s paintings were left unsigned by the artist. This one has a telltale mark of the artist, however: in the center of the ruined temple is a large circle which bears the coat of arms of his family. It was bequeathed to the university by physician Alexander Henderson who died on his estate Caskieben in Dyce, Aberdeenshire, in 1863. Henderson, an Aberdeenshire native who had attended Marischal College (which in 1860 merged with King’d College to become the University of Aberdeen) as a teenager, later went to medical school in Edinburgh where he had a successful practice. He was best known for having exposed Ann Moore, the fasting woman of Tutbury, as a fraud who had been eating just fine under the very noses of previous examining physicians. After moving to London, his medical career fell by the wayside, superseeded by his interests in art, literature and fine wines, on which he became a published expert. He traveled the continent collecting art and antiquities, amassing a notable collection of ancient Greek pottery mainly acquired from the freshly excavated ruins of Herculaneum. Two years after his death, the Aberdeen Journal printed an article listing the donated works and noting they were on display in a hall of Marischal College. The Ruins of a Temple was attributed to “B. Canaletti” which is not an accurate name. The author might have meant Bernardo Bellotto, Canaletto’s nephew, student and collaborator who was known to have used his patron’s nickname, but no art historians today think there’s even a slim chance of Bellotto having painted the capriccio. “It was often thought to be from the Canaletto school – that is, by one of Canaletto’s pupils or someone imitating his style,” explains Mr Gash. 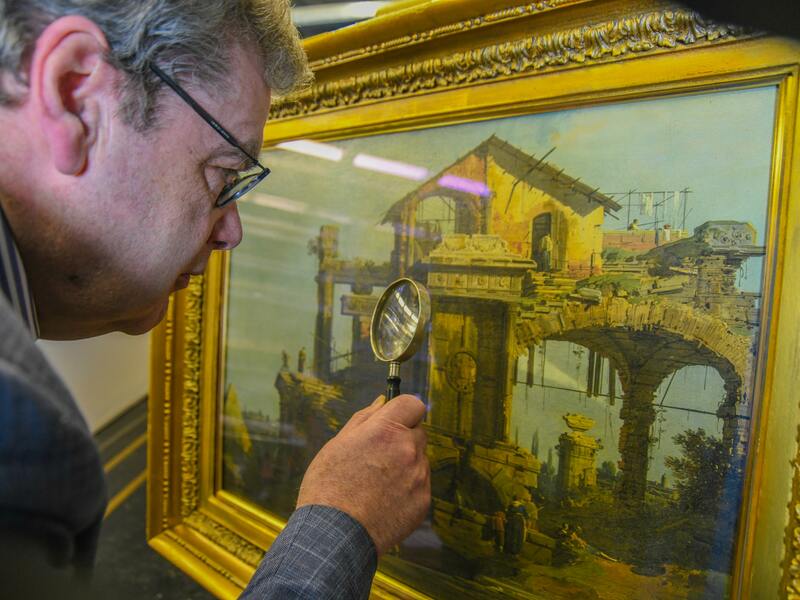 “However I and others have long suspected it was a real Canaletto and now we have been able to confirm this. The painting had previously decorated the University’s Principal’s house but has now been revealed as one of the University’s treasures.